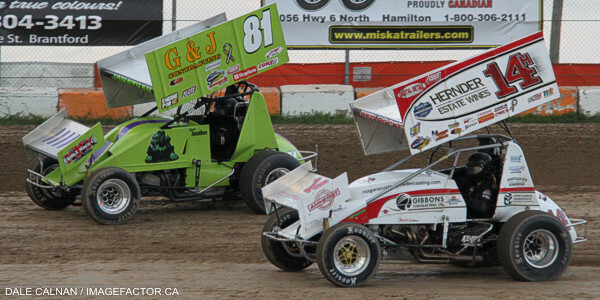 by Tommy Goudge (July 12, 2013) – 124 drivers signed in to race on Canadian Diabetes Foundation night presented by Best Western Cairn Croft Hotel and Kool Kidz Ice & Water at Ohsweken Speedway on Friday. Steve Poirier, Chris Dickie, Alex Schuts, Dusty DeBoer, Rick St. Pierre, and Bill Harju picked up the feature wins. Glenn Styres and Steve Poirier started the 25 lap Sprint Car feature on the front row. Styres got the early lead, but Poirier kept the pressure on with several challenges for the lead early in the race. The 3 time Canadian Sprint Car Nationals winner stayed close behind Styres after a lap 9 restart, and made his winning move in traffic on lap 12. Poirier stayed ahead of Styres for the remainder of the race, but Styres found a fast line above the cushion. The race was slowed for a second time on lap 19, when Chris Steele’s nose wing fell off and landed in the middle of turn one. 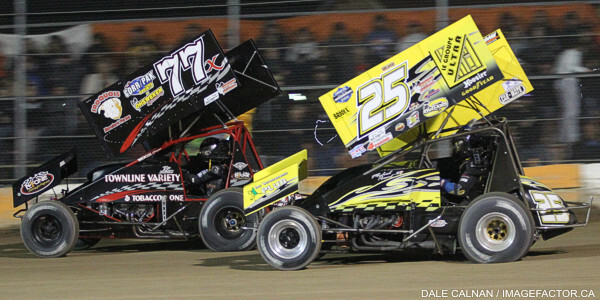 The double file restart employed in all Empire Super Sprints events didn’t derail Poirier’s drive to his 6th career Ohsweken Speedway feature win, despite a last lap slide job attempt by Styres. Poirier and Styres were followed by Mikey Kruchka, Bryan Howland, and Mitch Brown. Heat races for the 33 car field were claimed by Lance Yonge, Jim Huppunen, and Tom Huppunen, while Steve Collins won the B-Main, and Jim Huppunen won the Dash For Cash presented by Nathan Ackland State Farm Insurance, setting a new 4 lap track record in the process. Murray Nicholls and Steve Hess made up the front row for the 20 lap Thunder Stock feature, but 4th starter Ryan Dinning took the lead before the first lap was completed, and dominated the remainder of the race. A great race ensued for the runner-up spot, which turned out to be the fight for the win, when Dinning’s car did not make it through post-race technical inspection. Aaron Turkey held the 2nd spot until the halfway mark, when he got sideways exiting turn 2, and fell back. Chris Dickie took over the position, and held off several challengers to cross the finish line 2nd behind Dinning. Dickie was then awarded the win, followed by 24th starter Mike Miller, 22nd starter Dave Silverthorn, Jr., Kevin Dawson, and Bryce Richardson. Dickie also took over as the new points leader, as Cory Turner was unable to move through the field, and eventually finished 15th. Heat races for the 36 car field were claimed by Ryan Dinning, Terry Martin, Lee Winger, and Cory Turner, while Jake Brown won the B-Main. Dickie’s time of 6:50.19 is a new 20 lap track record for Thunder Stocks. Jamie Goudge and Kathi Dickie made up the front row for the 15 lap Mini Stock feature, but it didn’t take long for the top drivers in the standings to come through the field. The championship chase took a turn when Davey Boughton was collected in an incident on the frontstretch, which started with contact between Jon Janssens and Steve Miller. Boughton’s car was too heavily damaged to continue, and he was credited with a 21st place finish. Jason Lungaro and Alex Schuts raced side-by-side for the lead several times as the race neared completion, but Lungaro couldn’t complete the pass, and then had to hold off Chase Hess for the runner-up spot, while Schuts took his second win of the season. John Cote and Laura Hughes rounded out the top 5. Heat races for the 27 car field were claimed by Kathi Dickie, Chase Hess, and John Cote while Mike Taylor won the B-Main. Chad Foster and Valen Longboat made up the front row for the 12 lap Bomber feature, but Foster had problems early on, while Wayde Thorne got to the lead. Thorne led until Dusty DeBoer muscled his way to the front, and kept Thorne at bay long enough to claim his second win of the season. 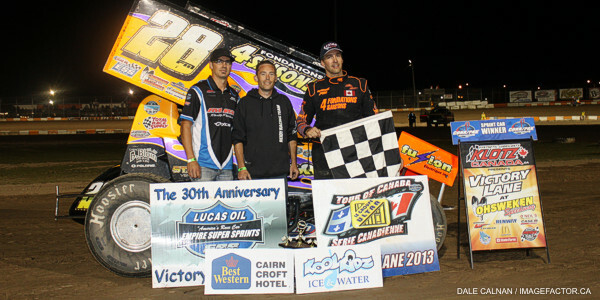 Thorne settled for the runner-up spot, followed by Jesse McDonald, Tim DeBoer, and Brady Longboat. Heat races for the 17 car field were claimed by Brady Longboat, and Tim DeBoer, while Bob Burgess won the B-Main. Rick St. Pierre got to the front and staved off a late challenge from Steve Arbuthnot to take the overall win in the Vintage Cars feature, along with the Modified division win. Bill Harju finished 6th, and was the highest finishing Sportsman division car. St. Pierre also won the heat race for the 11 car field. Jones Brown Motorsport Insurance and Evers Financial present Autograph Night at Ohsweken next Friday, July 19, featuring the Corr/Pak Merchandising Sprints, Affordable Towing & Recovery Thunder Stocks, HRW Automotive Mini Stocks, and Gale’s Auto Aftermarket Bombers. Spectator grandstands open at 6:00pm, with racing starting at 7:30pm! 1. 17j Lance Yonge (Penn Yan, NY), 2. 01 Mikey Kruchka (Hamilton), 3. 0 Glenn Styres (Ohsweken), 4. 1z Jessica Zemken (Sprakers, NY), 5.  f37 Kyle Moffit (South Dayton, NY), 6. 25 Michael Parent (Granby, QC), 7. 11 Jamie Turner (Caistor Centre), 8. 87 Jason Barney (Constantia, NY), 9. 19k Paul Kinney (Canastota, NY), 10. 5c Conor Mahoney (Waterdown), DNF. 07x Dain Naida (Tecumseh, MI). Time – 2:19.268. 1. 14h Jim Huppunen (Fenwick), 2. 28fm Steve Poirier (Saint-Mathieu-de-Beloeil, QC), 3. 51 Bryan Howland (Auburn, NY), 4. 80 Chris Steele (Fenwick), 5. 10 Mitch Brown (Brantford), 6. 13 Kevin Ward, Jr. (Port Leyden, NY), 7. 67 Steve Collins (Belfast, NY), 8. 9nz Havard Daniels (Coatesville, NZ), 9. 3r Shane Ross (Thedford), 10. 21j John Burbridge, Jr. (St. Williams), 11. 43 Scott Sherk (Port Colborne). Time – 2:20.733. 1. 27h Tom Huppunen (Fenwick), 2. 7x Jamie Collard (Burford), 3. 35 Jared Zimbardi (Salamanca, NY), 4. 5 Keith Dempster (Alton), 5. 90 James Evans (Beamsville), 6. 49 Todd Hoddick (Cheektowaga, NY), 7. 81 Derek Jonathan (Lewiston, NY), 8. 422 Etienne Girard (St-Germain, QC), 9. 94z Stan Zanchin (Fort Erie), DNF. 30g Steve Goldner (Aylmer), DNF. 10j Jeremy Hughes (Burlington). No Time. 1. 67 Steve Collins, 2. 87 Jason Barney, 3. 19k Paul Kinney, 4. 11 Jamie Turner, 5. 81 Derek Jonathan, 6. 422 Etienne Girard, 7. 9nz Havard Daniels, 8. 3r Shane Ross, 9. 94z Stan Zanchin, 10. 5c Conor Mahoney, 11. 21j John Burbridge, Jr., 12. 43 Scott Sherk, 13. 10j Jeremy Hughes, DNF. 07x Dain Naida, DNF. 30g Steve Goldner. No Time. 1. 1 Kathi Dickie (Brantford), 2. 64 Doug Erskine (Hamilton), 3. 69 Rob Twitchett (Dundas), 4. 66r Cole Rodwell (Caledonia), 5. 16 Jeremy May (Hamilton), 6. 76 Jamie Goudge (London), 7. 84 Jade Pelletier (Wainfleet), 8. 22 Brittani Myers (Hamilton), 9. 11 Mike Giberson (Caledonia). 1. 7x Chase Hess (Ohsweken), 2. 66 Jon Janssens (Woodstock), 3. 29 Lucas Lubin (Hamilton), 4. 53 Rodney Rutherford (Waterdown), 5. 10 Laura Hughes (Puslinch), 6. 69e Dan Erskine (Caistor Centre), 7. 05 Dave Goodacre (Brantford), 8. 96t Mike Taylor (), DNF. 21 Jonathan Ayrton (Hamilton). 1. 38 John Cote (Hamilton), 2. 79 Steve Miller (Paris), 3. 7 Jason Lungaro (Hamilton), 4. 81 Alex Schuts (Oakland), 5. 99 Robin Elliott (Woodstock), 6. 12 Chantelle Hyatt (Millgrove), DNF. 18x Davey Boughton (Carlisle), DNF. 37 Rob Hoskins (Harley). 1. 96t Mike Taylor, 2. 37 Rob Hoskins, 3. 21 Jonathan Ayrton, 4. 18x Davey Boughton, 5. 05 Dave Goodacre, 6. 11 Mike Giberson, 7. 84 Jade Pelletier, 8. 22 Brittani Myers. 1. 66 Brady Longboat (Ohsweken), 2. 43c Chad Foster (Hamilton), 3. 7L Valen Longboat (Ohsweken), 4. 21 Mark Bazuin (Caledonia), 5. 6 Wayde Thorne (Waterford), 6. 03d Dakota Potts (Waterford), 7. 36 Skip Brandow (Orwell), 8. 14 Gerald Burnham, DNF. 32 Gillian Hils (Dundas). 1. 9 Tim DeBoer (Caledonia), 2. 88 Jesse McDonald (Caledonia), 3. 23 Dusty DeBoer (Hagersville), 4. 97 Max Chechalk (Hamilton), 5. 32h Lee Hils (Dundas), 6. 28 Bob Burgess (), 7. 155 Dustin Longboat (Ohsweken), DNS. 42 Joe DeBoer (Hagersville). 1. 28 Bob Burgess, 2. 42 Joe DeBoer, 3. 14 Gerald Burnham, 4. 155 Dustin Longboat, 5. 32 Gillian Hils, 6. 36 Skip Brandow, DNF. 03d Dakota Potts.